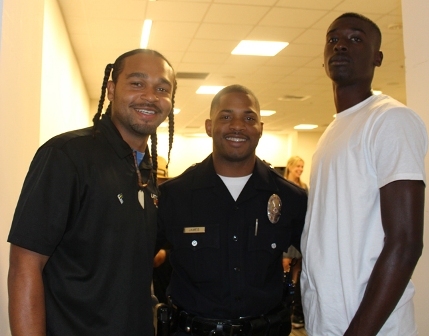 The Los Angeles Police Department came out to the Baldwin Hills Crenshaw Plaza, along with the Institute of Nonviolence in Los Angeles, to have an open dialogue with youth about how they could be better officers on Tuesday, August 30, from 6 p.m. to 8 p.m. Youth from various teen, after-school and foster-care programs came and held no bars as they raised questions about gun control, police brutality and more. The event took place in the community room at the Crenshaw Mall where nine round tables were set up to where each table had a police officer, a facilitator to guide the conversation and about six youth. Many of the youth started off reluctant because it was a mandatory event, but it didn’t take long for the whole room to be filled with conversation. The ‘Days of Dialogue’ events have been going on in Los Angeles since 1995 where community members are given the opportunity to voice their concerns to the LAPD, but this was one of the rare occasions where the focus was on young people. The teens brought up ways to have more productive training by proposing that officers get to know their community on a positive level for some months before going in with a badge and gun. The officers also gave input on their perspective and put the teens in scenarios so they could get an idea of what is going through an officer’s mind. The topic of social media also came up as the youth talked about how they would like to see more efforts to combat cyberbullying. They also said that social media could be a way for officers to reach out and have a better image. The insight was gained on both sides as many of the police officers were open to the negative criticism. They encouraged the youth to give their opinions and have a discussion where everyone can be heard. For more information about how you can join the discussion, visit www.daysofdialogue.org or www.futureofpolicing.org.